“The mass of men lead lives of quiet desperation.” The quote’s probably Henry Thoreau’s most famous, and lies at the center of Douglas Sirk’s All That Heaven Allows. 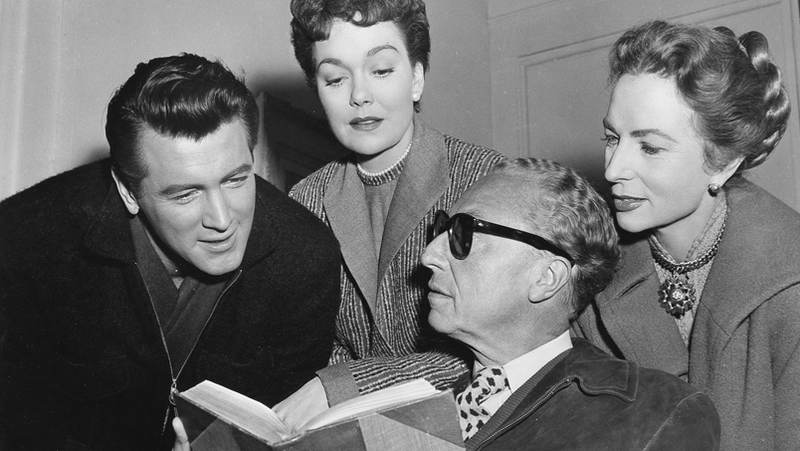 Like much of Douglas Sirk’s “greatest hits,” the film is a highly glossed and succinct critique of American bourgeois values masquerading as romantic melodrama. It examines the pressures, contradictions, and sheer hypocrisy faced by women in a patriarchal society. The plot is simple: recently widowed Cary (Jane Wyman), falls in love with her younger and much poorer handyman, Ron Kirby (Rock Hudson). Although the pair love each other, their class and age difference creates quite the scandal in her world of small town suburbia, leading Cary to a difficult choice: play the role society expects of her or choose her own path, even if it means rejecting the comfortable life she knows. And, while the film concentrates on the quiet desperation of Jane Wyman’s character Cary, chronicling her journey from the tight confines of suburban society to the freedom of living for the self, I want to focus on another character held firm by the trappings of American suburban culture: Sara Warren, played brilliantly by the wonderful Agnes Moorehead. The introduction to Sara is quick. She is the first character to speak and the first character to interact with the film’s protagonist, Cary. It’s through Sara that we get our first glimpse at the constrictive environment the two women inhabit. Their ladies’ lunch is cancelled because Sara’s husband last minute guest of honor has forced her into a situation where she must host a “club party,” leaving her with no time for her previous engagement with her friend. And with that exchange we are introduced to the film’s underlying theme: external societal expectations vs. personal desire – that “quiet desperation” I was talking about earlier. While Cary learns the depths of her own quiet desperation through her interactions with Rob and his friends, Sara is fascinating to watch because she seems to have accepted her own “quiet desperation” a long time ago. Throughout the film we get the impression that she is well aware of her own quiet desperation, and with that knowledge, works within its confines. She would never dream of turning her back as a pillar of the community, even if it’s a position she doesn’t actually enjoy. What I love about Moorehead’s performance in the film is the almost unconscious duality she brings to the role of Sara. Sure, she’s a card-carrying member of cocktail society and accepts her role, but she also seems to harbor a certain distain for it well. She is the only “society” character in the film to try and understand Cary’s motivations in her relationship with Ron Kirby, yet at the same time she tries to manipulate the situation in a way that conforms to their cultural norms. There is both a genuine sympathy in Moorehead’s performance and an unintentional smothering that is representative of the highly constrictive society she and Cary belong to. Just take a look at their first scene together. While explaining her predicament with the club party, Sara tells Cary, “Sometimes I think you’re smart for not being a club woman.” Although it seems like a simple offhand remark made in response to her mounting responsibilities, it also reveals an understanding of how much of her time is occupied by the club and its members – how much she must sacrifice in order to “keep up appearances”. The statement also shows a certain understanding into her friend’s ungregarious behavior. Despite this ability to empathize with her friend’s understandable anti-social behavior (she is a recent widow, after all), Sara ultimately invites Cary to the very club dinner she was just complaining about. Cary initially refuses but Sara will not take no for an answer and politely but firmly states she already has a date lined up for the recent widow. In this scene Moorehead has a tricky task. Not only must she introduce the films theme and early exposition about the protagonist, she also must act as an understanding empathetic friend and external societal force. She plays it small and contained, reacting to Wyman’s expressive acting more so than creating her own emotions. If you think about it, Sara’s actions in the scene are actually rather distasteful. She’s canceling lunch with her friend then coercing Cary to go to a party she clearly doesn’t want to attend. However, her gentle tone and empathetic reactions paint Sara in a positive light and gives shape to what could be a clueless character. Already, you get a sense that Sara is a good person but is trapped in the confines of her world. All of her actions are dictated by the expectations of her bourgeois surroundings, even her acts of friendship. However, just because she follows the rules of society, doesn’t mean she likes them. This can clearly be seen at that last minute party. Here, we see Sara in her element. She’s the beautiful wife, gracious hostess, and all-around pillar of the community. Basically the picture perfect Americana wife. In the scene she once again plays the sympathetic friend to Cary’s nervous energy, taking her by the hand and introducing her to all the VIPS. But then Mona, the town’s number one source of all things gossips, prances into the conversation uninvited. Honestly, Sara’s scenes with Mona are some of my favorite in the film because I find her quiet contempt for Mona’s brand of gossipy small talk simply delicious. She completely nails that carefully confined “nice” hatred only a 1950s melodrama could produce. She doesn’t scold Mona or kick her out – that wouldn’t fly in polite society, however, the hatred is palpable. With nothing but a slew of accusatory glances and a tone of bitter disbelief, Sara makes her feelings towards Mona clear without ever outright confronting her. This contempt of Mona becomes even more interesting when you consider Mona’s function in the film. Sure, she’s the town gossip but more than that, she acts as an agent of fear that keeps everyone “in line”, so to speak. If Mona sees a person act in way that’s contrary to the country club range of acceptable behavior, soon the whole town will know. Mona is the all-seeing eye of moral judgment that is attached to a very big and very loud mouth. So, beyond having contempt for Mona on a personal level, Sara’s feeling for Mona also represent her relationship to her surroundings in general. Although Sara has a clear distain for Mona, she will never truly confront her toxic presence. Perhaps even more than her friendship with Cary, Sara’s cold relationship with Mona represents her suburban duality – that quiet desperation of accepted duty and passive distain. 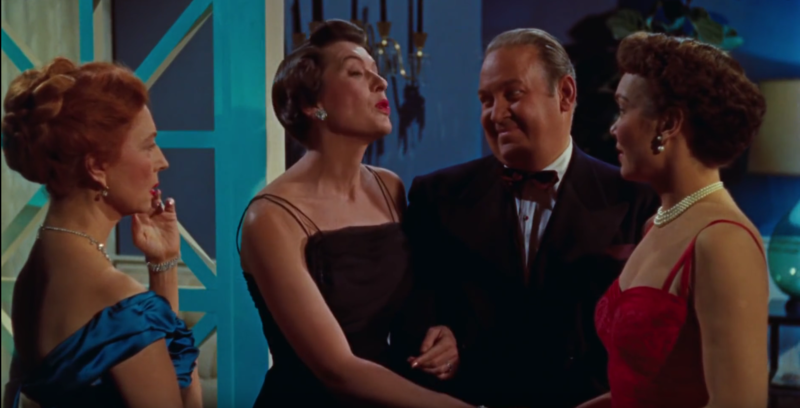 And while Sara’s relationship with Mona best demonstrates her duality as a character, Moorehead’s best acting scene is when she finds out about Cary’s relationship with Ron. When Cary confirms her relationship with Ron to Sara, she basically can’t even believe it. It goes contrary to everything she knows about her dear friend and against every rule of polite society. A rich older widower with a younger, poor man? Say it ain’t so. A this moment Sara is basically in full “country club woman”-mode, and for the first time, appears to have some certain contempt for Cary’s actions. 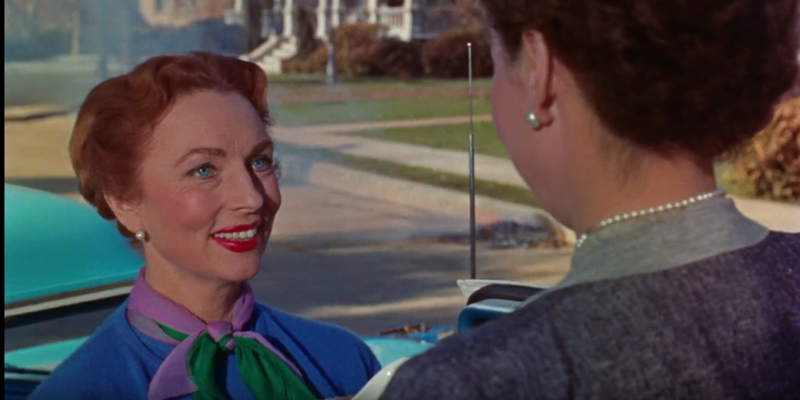 She recites the myriad of reasons why a relationship with Ron is a bad idea, with all of them, of course, stemming from the bourgeois values Sara allows to dictate her life and basically amount to the notion of: “What will people say?” I must say that this is probably the biggest “Agnes Moorehead” moment in the film. Her tone, her posture, and her face are all stern, cold and far more judgmental than we’ve seen throughout her performance. In Sara’s own words she admits that “Maybe I’m a snob.” But when Cary makes her intentions to marry Rob clear, Sara softens. And as quickly as she became the stern voice of societal reason, she reverts back to the friend with soft eyes and a big heart. She then tries to remedy the situation the only way she knows how: through the country club. Yes, instead of just simply accepting Cary’s decision and letting it end there, Sara must make sure it’s done with approval of their small social circle. Rather than live with the uncomfortable nature of Cary’s relationship with a younger and less privileged man, Sara tries to spin the situation in a way that would bring Ron into the fold and invites him to the clubhouse dinner. Unlike Cary, Sara refuses to exist outside the confines of country club society and tries to assimilate those around her rather than accept that perhaps some people are just different. What I love about this scene is that it shows just how much Sara is shaped by her surroundings. Despite her clearly empathetic and kind nature, she just cannot allow herself to go against the grain of society. Yet, at the same time, she fully admits the only thing really keeping Cary from enjoying her new love life is the toxicity of those they surround themselves with. Sara tells Cary “You’ve got stubbornness…and courage.” I personally think this is one of Sara’s defining lines in the film, revealing her true feelings not only about Cary but also about herself. Cary has the gall to stand up to the gossip-mongers in town and defy the rules of “polite society.” Sara, despite her clear contempt of it, does not. Cary is able to overcome that quiet desperation in her life with the added weight of the town watching her. Sara, on the other hand, will never overcome her life of quiet desperation. Cary has courage whereas Sara has conformity. Sara will continue to host predicable club parties for predicable club people until her desperation is so smothered by her bourgeois surroundings that not a peep of it will be heard. Sara will live a life of silent desperation. A Big Thank You to In The Good Old Days of Classic Hollywood for hosting this wonderful event! There are so many more wonderful Classic Bloggers participating in this Blogathon so please be sure to check out the other entries. 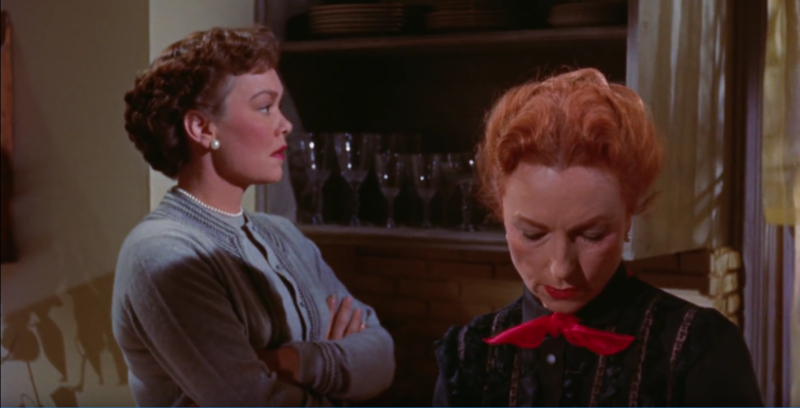 This entry was posted in Blogathons, Posts by Minoo Allen and tagged agnes moorehead, agnes moorehead blogathon, all that heaven allows, Blogathon, Classic Movies, douglas sirk, henry thoreau, Jane Wyman, melodrama, rock hudson. Bookmark the permalink. Terrific piece. A great evaluation of the differences between the two women. And the subtlety of the screen writing that doesn’t make Sara one – dimensional. Pingback: THE AGNES MOOREHEAD BLOGATHON IS HERE – In The Good Old Days Of Classic Hollywood. Excellent insights into a classic film and its characters. Agnes Moorehead’s layered performance as Sara is an important component in what makes All That Heaven Allows work as beautifully as it does. The viewer cannot totally judge because we also relate and understand the conflicting emotions presented.